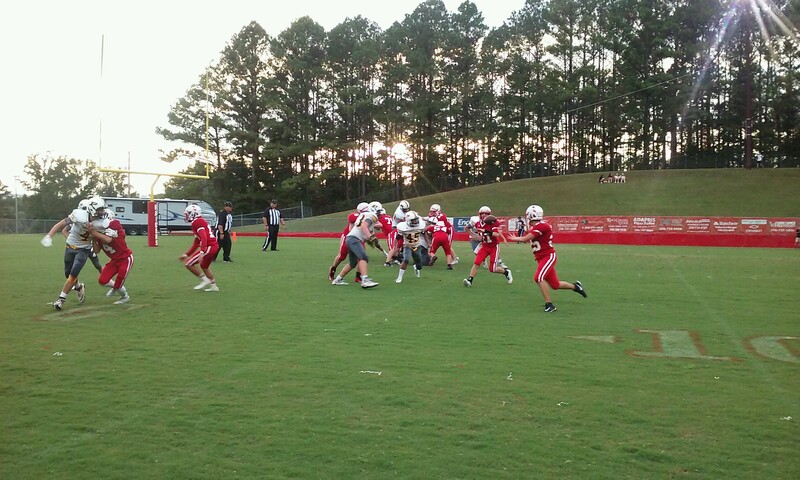 GOOD HOPE – Good Hope’s JV squad faced off against the Priceville Bulldogs on Monday night, and the Raiders dominated on both sides of the ball en route to a 36-0 shutout victory. Each defense forced a three-and-out on its respective first series. The Raiders’ Jager Burns picked off a pass on Good Hope’s next series and later cashed in on that opportunity; after Tanner Malin found Burns for a 14-yard pass, Michael Owens found the end zone and scored on a 3-yard run to put Good Hope on the scoreboard, 6-0, with 2:42 remaining in the opening quarter. After the Raider defense forced the Bulldogs to turn the ball over on downs, the next possession saw Good Hope find the end zone on the first play courtesy of a Malin 43-yard touchdown pass to Cameron Twilley with 59 seconds remaining to make it a 14-0 lead after the 2-point conversion. Three Bulldog penalties on their next series helped out the Raider defense and Will Flynt ended the drive with a sack. Malin found the end zone on Good Hope’s second play of its next series on a 30-yard touchdown run to make it a 22-0 lead with 3:58 remaining in the first half. Brandon Oliver picked off a pass on the next series and Owens later found the end zone on a 7-yard run to widen the Raider lead to 28-0, which mirrored the score at the half. Owens found the end zone for the third time in the game as he broke free for a 54-yard run on just the second play of the second half for Good Hope’s final touchdown of the game, the lead swelling to 36-0. Lucas Hill made it three sacks for the Raider defense on its next series as Good Hope forced another punt; the defense looked to preserve the shutout later on in the game and did just that as Drew Easterwood made an interception. Owens rushed for 89 yards on just eight carries and three touchdowns. Malin went 3 of 3 for 72 yards and a score; he added 79 more on the ground and a touchdown. Good Hope’s defense held Priceville to just 49 yards of total offense along with the three interceptions and three sacks in the games, one each by Flynt, Hill and Jared Pugh; Walter Perez also had a big game on defense. The Raiders were called for just three penalties for 15 yards for the whole game. The Raiders improve to 2-0 overall on the season. They will stay at home next week against the Vinemont Eagles.